Great for use all over if you don’t have pets or small children in the home. EPA-approved. Ideal if you don’t want gels or powders out where they can come in contact with pets or people. With the number of baits that come in this package, you can place these inside, outside, in cupboards—anywhere you suspect critters. Roaches are able to hold their breath for up to 40 minutes and even when submerged underwater, can survive up to a full 30 minutes. Additionally, the critters can run up to three miles per hour, making it easy for them to spread germs at a rapid rate. These insects are linked with outbreaks of diseases such as cholera, dysentery, and typhoid fever. So, getting an infestation out of your home is crucial. Cockroaches are ranked among the most adaptable creatures on the planet. Controlling and eradicating a cockroach infestation is often tricky and can cause ongoing frustration. The disgust people feel when dealing with a cockroach infestation is why we compared the best roach baits of 2018 to remove these insects from your home. With all of the products below, we recommend using gloves to protect your hands when you apply them and take precautions to avoid inhaling any powders. 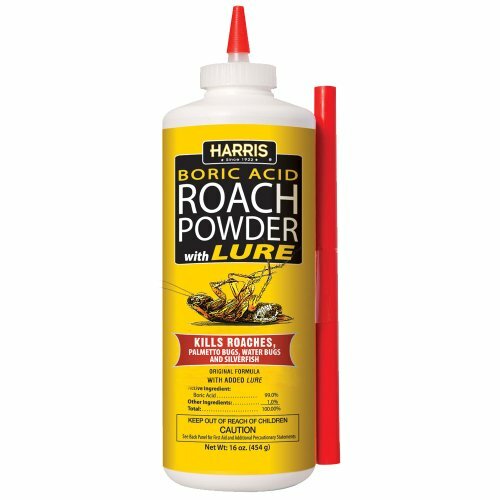 Harris Boric Acid Roach Killer The powder contains a lure to which roaches are said to be attracted. The appeal of using a powder like such is that you have more control over where the lure and roach killer is applied. As opposed to a pack of plastic stations you can only set in as many places as traps you have, a powder can be spread all along crevices and roach-prone areas. A bonus of this product is that it also eradicates silverfish. So, if you have a problem with those speedy buggers, this powder should take care of that, too. Keep in mind, this is a powder that will sit along places like baseboards, so if you have pets or small children use extreme caution when considering how that will work out in your home. If you’ve only seen one or two cockroaches, or know you are just dealing with a small infestation, this product is ideal. 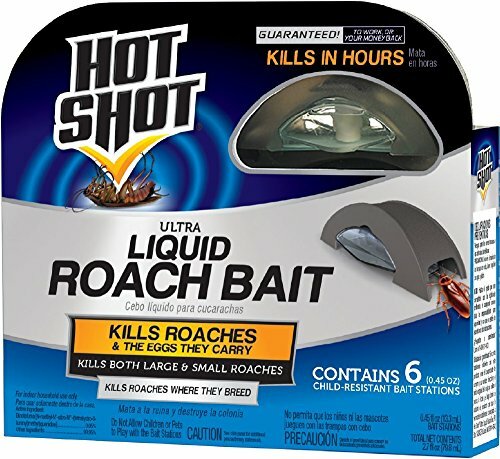 The Hot Shot Ultra Liquid Roach Bait comes with six small stations to kill roaches and their eggs. The premise behind this roach killer is the lure of appealing food and water within the station in a no spill, no drip device. This lure is also alluring to ants so it can take care of an indoor ant problem as well. You pull the tab on the side of the station which will break the seal of a vile containing the bait inside. Then place the stations where you have seen ants or cockroaches, or in areas near walls, cabinets, under sinks, or near your refrigerator. 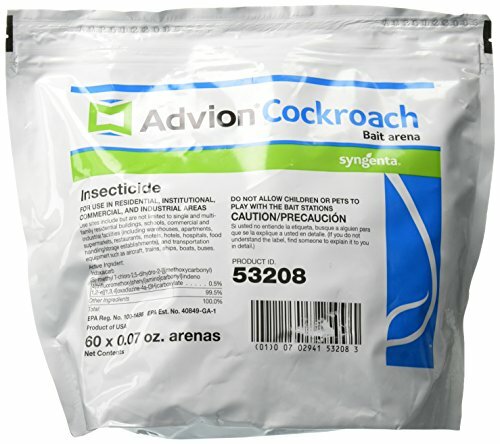 The Advion Cockroach Bait Station (60 count bag) uses a small, circular station or “arena” that utilizes the active ingredient indoxacarb which is a slow acting insect killer. The Advion roach killer claims to have no residue or odor. With 60 of these stations in a bag, you can place these cockroach killers in several places and cover a lot of ground, even in larger homes. The slow pace of this poison provides enough time for the cockroaches to spread the poison throughout their colony. This product is said to last a long time, with one customer stating it lasted up to three years. 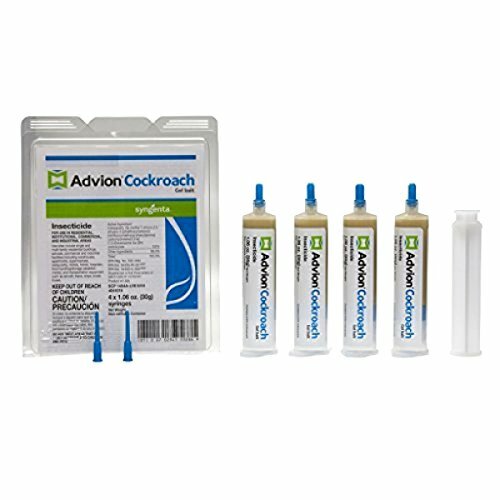 The Advion Cockroach Gel Bait (four syringes of 1.06 ounces each) is the highest rated roach killer on this list. Rather than a powder or plastic station, this is a gel bait that can be used near food handling areas, and in commercial, industrial, and residential places. Because it will not blow away like a powder, it can also be used for both indoor and outdoor use. Advion Cockroach Gel Bait utilizes MetaActiveTM as a trademarked active ingredient that is noted to be suitable for up to two years. One review suggests placing the gel product on tape for easier cleanup and re-application. Apply this gel along crevices or areas roaches are likely to creep or have been seen. Roaches originated in tropical areas, but live in temperate zones where warmth, moisture, and food are found. Cockroaches are mostly active at night and live in groups most often. These insects usually hide during the day in cracks and crevices in walls, along walls, and in secure places such as under furniture, in cupboards, basements, electrical devices, and even drains. Do not use poisons in vents where the chemicals can be blown through the air in your house or apartment and cause respiratory distress. As with handling any poisons, always use extreme caution and consider pets, children, and the environment. Wear gloves when applying any kind of roach killer, as well as when you clean them up. If you use a powder, wear a dust mask while applying the product. Do not leave powders and gels out where small children or pets can come in contact with them. Do not use poisons in vents where the chemicals can be blown through the air in your house or apartment and cause respiratory distress. With any product you select, if you are trying to remove cockroach infestation, you need to clean any spills and crumbs right away so that food is not readily available for the roaches. Remove food bits from not only the floor and counters but also cupboards. Keep your home dry and immaculately clean. Do whatever you can to eliminate moisture from around the foundation of your home, as well. Keeping these steps in mind, combined with a great product should help rid your home of roaches. As always, use caution when applying this roach killer near your own food sources and package any consumables in bags, plastic, or glass containers to protect your food from coming into direct contact with the gel. Packing all of your food in plastic or glass containers to prevent roaches from getting into them is another measure you can take to keep them from finding nourishment in your kitchen. Remember fruit trees if you have any right next to your house, too. Fallen fruit on the ground should be cleaned up as much as possible. While you never want to mix two types of poisons together, you can consider two methods of pest control if you have an excessive number of roaches. Some people have a professional come in and bug-bomb their home, then follow up with their own bait to prevent cockroaches from returning. You can also spread a powder like the Harris Boric Acid around and also use the disposable bait stations in spots you have seen cockroaches. Or you can try both Advion’s gel with bait stations to test if you have more successful results. The good news is that as hardy as cockroaches are, they can be removed entirely from your home.